Any statement of value must contain the elements of what something is worth, to whom, when and under what circumstances. An unexplained number is at best useless, and quite possibly misleading. That’s just fundamental to the concept of value and nearly every discussion of value ends up with someone talking about ‘fair market value’ as some well understood benchmark that you can work from. Rarely is it defined but since fairness is the objective it sounds reasonable. Don’t bet on it. To appraisers this phrase is a legal term and it gets defined by whatever court has jurisdiction over the case at hand. They aren’t all the same but it’s never how people routinely think of this phrase. It’s confusing even to people within the courts and doubly so for the general public. For starters, it’s not about being fair. See § 1.170A-1(c)(1), (h)(1) and (2). Fair market value is the price at which property would change hands between a willing buyer and a willing seller, neither being under any compulsion to buy or sell, and each having reasonable knowledge of relevant facts. The root of the term is from the old English word ‘faire’, meaning a public and open marketplace, not the modern usage of ‘fair’, as in equitable or reasonable. The difference is important. We all know there are several different marketplaces for everything and prices can vary by quite a bit from one to the next. Most courts, including the tax court, are interpreting it to mean that it’s a hypothetical transaction taking place involving a sale to the end user and in the ‘usual and customary marketplace’. That is to say, what would a knowledgeable end user be expected to pay for the subject property in it’s present condition and in the usual marketplace and under the usual conditions where people buy such things. This same rule holds whether you’re talking about diamonds, real estate, stocks, fine art, patent rights or anything else you can own. Contrary to common assumption, FMV is not estimating what you can expect get for it (that would usually be called resale, market, or liquidation value) or even what you would be expected to pay for it in your own chosen marketplace (That’s another flavor of market value, which will vary depending on where and how you shop). The difference can be large and terribly important in understanding the concept of ‘value’, especially as it applies to jewelry. Custom Skull Pendant – Value? As way of example, imagine a pendant made of heavy 14k gold in the form of a skull with big ruby eyes that blink, a movable jaw and diamond baguette teeth. It’s made of excellent materials, it’s beautifully crafted … and it’s hideous. What’s this thing worth? If you wanted one, the ONLY way you would have any reasonable chance of getting it is to hire a custom jeweler to make it. Stores just don’t stock this sort of thing. Based on the design and craftsmanship, you would need to hire a darned good jeweler to make it. Chances are good that you’re going to have to pay a bundle, this is not an easy job, and it’s going to cost you thousands of dollars just for the labor. He may even charge you extra because it’s ugly and he doesn’t want to get burned when you figure that out and refuse to pay when you pick it up. Figure $6000 for the piece. That may be fair, but it’s definitely not fair market value. Now imagine that you have inherited this thing and you want to sell it. Grandma had it and she loved it. She bought on the TV and paid $2500 for it. That’s pretty big money and you’d rather have the cash thank you very much. Your sale is going to be tough, as I’m sure you can imagine. There’s probably some Rap star out there who would like it but you don’t know their phone number and neither does your jeweler. Shop it around to the various buyers of such things and your bids are going to be based on the scrap value of the gold. The stones will add little or nothing because of the labor required to get them out intact and the damage risk in the process. You’ll see a few hundred dollars. If they buy it they’ll scrap it out to the refinery along with an assortment of other junk and make a margin on the flip. As with the above, that’s perhaps fair, but it’s not fair market value. Let’s now assume that some jeweler somewhere is manufacturing these things and it’s currently in production. It fits his/her customers taste and they’ve got a mold for the parts, practice in putting it together, and occasionally sells one new for $4000. They made a special deal with the TV folks a few years ago to buy 100 of them for a discount and that’s how Grandma ended up with it for less. They aren’t flying out of the showcase but they’re moving enough of them to keep it in the catalog. $4000 may seem like FMV because it’s a copyrighted piece and they’re the only ones who have that mold. That’s the only place you can get a new one so it seems like the only market choice but it’s a trick question. They’re selling NEW. The one you have is USED. Chances are good that you couldn’t get a used one there even if you somehow found the store so this is not only not the usual market, it’s not even a possible market (this is an important assumption, it changes things if the jeweler does, in fact, buy and sell secondhand goods). As with the above, $4000 may be fair, but it’s still not Fair Market Value. To get to FMV you need to decide what the ‘usual and customary’ market for the thing is, in this case a secondhand ugly skull pendant made of gold and gems. Where would you look for such an item? Pawnshop maybe? An auction house perhaps if it’s cool enough or if the designer has a recognized name. Certain vintage type jewelers might have it but I’d be surprised, this is pretty far out on the fringe. Maybe it’s that designer from the previous paragraph. My gut feeling is a pawnshop is the right place for it but this would take a bit of research into the specific piece. Research into this is part of a good appraisal process and is beyond the scope of this article but let’s assume the pawnshop. They’re going to put a price tag on it and wait for someone to come in who likes it. Then they’ll then start to negotiate. Regularly it’s $3000 (appraised for $6,000!) but we’ll sell it today for only $1500!!! Maybe they’ll get it and maybe they won’t, that’s what the salespeople are for. If you can reasonably expect that this is what it’ll go for, THAT’S the FMV (willing buyer – willing seller, no compulsion, reasonable knowledge, current condition, appropriate marketplace). Remember, it’s not the number on the price tag, it’s the number on the check that counts. An important thing to notice is that the value we’re coming to is what the pawnshop is going to be expected to sell it for, not what they’re going to pay or even what they’re asking on the tag. They’re going to want to buy it cheap because; a) they’re a pawnshop; b) it’s ugly; and c) they can. Since they’re not the end user, the sale to them isn’t the one that counts and they can ASK whatever they want. That’s not the same as getting it. So what is it “worth?” What’s fair? Never heard of something so odd? It happens all the time. How about this? 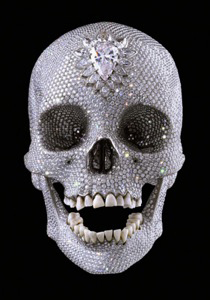 Damien Hirst made and reportedly sold this diamond encrusted skull in 2007 for $100,000,000. Harry Levy, vice chairman of the London Diamond Bourse and Club, said “I would estimate the true worth of the skull as somewhere between £7 million and £10 million. Really? To whom, when and under what circumstances?